The second most frequently asked technical question we receive is regarding equipment failing a leakage test. Although most modern PAT instruments carry out a leakage measurement as part of their pre-set test sequences, it’s worth bearing in mind that the IET Code of Practice advises that the purpose of a leakage test is as an alternative to the insulation test. For example when testing electronic equipment where the filters designed to protect against overvoltages can cause a low insulation resistance reading. Because a substitute leakage test can be inaccurate, the IET Code of Practice also advises that it must not be used as a replacement for an insulation test. The substitute leakage test is primarily used when testing PCs, to prevent them from turning on during the test. A normal supply voltage leakage test would turn the PC on for just a few seconds causing boot errors when restarted. However more recently, with the introduction of battery operated PAT instruments, a subleakage test is often carried out on all equipment as they have insufficient power to run a supply voltage test. If possible, equipment failing a substitute leakage test should be re-tested using a proper leakage test at the supply voltage. 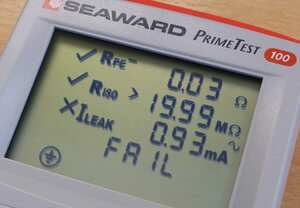 Some battery testers, such as the Megger PAT150 and the Seaward Primetest 250, can perform a supply voltage leakage test when powered from a mains supply. However, the most common reason why equipment often appears to fail a leakage test is that an incorrect pass limit is used. Many of the basic PAT instruments are pre-set set to the lowest possible limit of 0.75mA for class 1 equipment. Therefore it may be necessary to override the fail result given and use the higher limits allowable depending on the equipment type. Many untrained users assume you can simply plug an appliance into a tester and it will give a clear pass or fail result. Unfortunately this is not the case; knowledge of the tests, equipment types, and limits is always required. Some equipment is actually designed to operate with a higher earth leakage than shown in the table above. For example, motors with electronic speed controllers often have EMC filters that produce a leakage current. This can cause an electric shock by simply touching exposed metal parts if the earth becomes disconnected. Therefore equipment designed to run with a leakage current greater than 3.5mA can not be used with a standard 13A plug and socket. It must be permanently wired via a fused spur or connected with an industrial plug and socket. It should also have a label warning of the high leakage current and the earth conductor must also be at least 1.0mm2. For equipment with a leakage current greater than 10mA, additional precautions are also required. Terminology: For clarity we've used the term 'leakage test', however the IET Code of Practice uses the technically correct terms ‘Protective Conductor Current Test’ and ‘Touch Current Test’. Equipment manufacturers can use a variety of terms: mains leakage, differential leakage, touch leakage, earth leakage, and leakage current. They are all referring to the measurement of current leaking from the live parts to either the protective conductor for class 1 equipment, or the appliance case for class 2 equipment. And just in case your wondering; the number one spot for the most frequently asked question is - "How do I get an earth on a laptop charger?" We’ve written an article with some information here.